Citation Information: J Clin Invest. 2018;128(9):3866-3871. https://doi.org/10.1172/JCI91921. 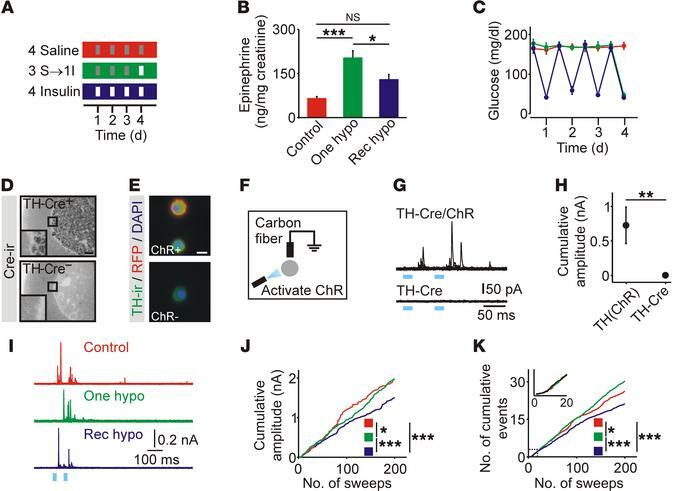 Recurrent episodes of hypoglycemia suppress catecholamine release from adrenal chromaffin cells. (A) Schematic of glycemic protocols. Red: recurrent saline (Control); green: recurrent saline plus insulin (One hypo); blue: recurrent insulin (Rec hypo); gray: saline injection; white: insulin injection. I, insulin; S, saline. (B) Hypoglycemia-induced epinephrine release in vivo was blunted after recurrent insulin injection (n = 10). (C) Insulin injection evoked a reproducible fall in blood glucose levels (n = 9–10). (D) Cre immunoreactivity (Cre-ir) was restricted to the adrenal medulla in TH-Cre+ mice. (E) In TH-ChR(tdTomato) mice, RFP fluorescence was present on the cell membrane of chromaffin cells. TH-ir, TH immunoreactivity. (F) Catecholamine release was evoked from chromaffin cells in vitro using ChR-mediated depolarization and detected using carbon fiber amperometry. (G) Example of optogenetically evoked amperometric events. (H) Catecholamine secretion was detected from TH-Cre+ chromaffin cells that also expressed ChR (n = 12–13 cells). (I) Examples of amperometric events from mice exposed to glycemic protocols. (J) Cumulative amplitude of amperometric events (control: 554 events; 1 hypoglycemia: 1,008 events; recurrent hypoglycemia: 597 events; n = 21–33 cells per condition from 4 animals per treatment; plot was normalized to the number of recorded cells). (K) Cumulative number of amperometric events (from experiments in J). Scale bars: 100 μm (D), 10 μm (E). *P < 0.05, **P < 0.01, and ***P < 0.001, by 1-way ANOVA (B), Wilcoxon rank-sum test (H), Kolmogorov-Smirnov test (J and K).